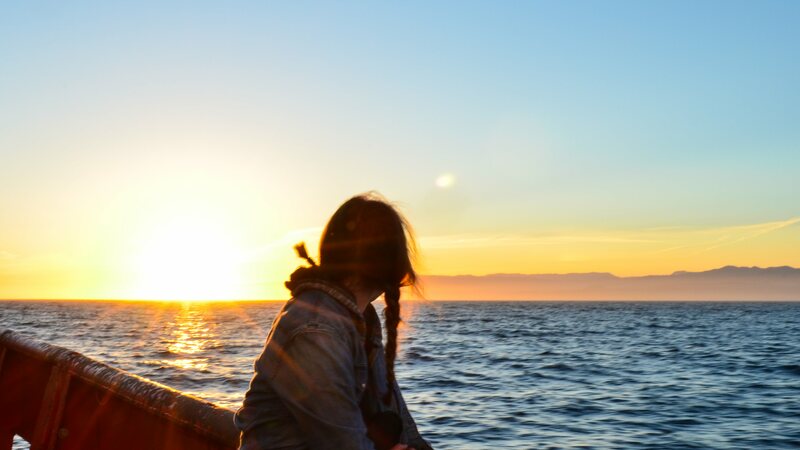 InFORM undergrad, Annaliese Meyer, has spent three weeks aboard the CCGS Sir Wilfred Laurier from July 3-24 as it sailed from Victoria, BC to Dutch Harbor, AK and on to Barrow, AK. Along the way she filtered nearly 3000 L of seawater for InFORM samples which will be shipped to Dr. John Smith in Nova Scotia for analyses. Check out all of her posts: I Need to Explore, Out of Sight of Land, Mostly Regarding Food, The Life Aquatic, Caffeine and Bittersweet Farewells. If you enjoy hearing from Annaliese, she has more in store! She will be aboard the CCGS John P Tully on a Line P monitoring cruise from August 15-31. Look for additional posts through our blog or social media. The coastal average concentration of cesium-137 is now at 2.7 Bq per m3 according to data from samples collected in January and February 2017, which are now available. While nearly 300% of the pre-Fukushima levels, our observations remain extremely low when compared to the 10,000 Bq per m3 drinking water limit as set by Health Canada’s Radiation Protection Bureau. Since early in our monitoring we have measured a distinction between samples collected from oceanic locations compared to those collected in more estuarine settings. As we have previously explained, there are physical explanations for this as it simply takes time for the plume waters to transit the distance into the Salish Sea. In addition to the circulation explanation, we have wondered if there is also a connection between the salinity of the waters sampled and the activity of the cesium signal. The hypothesis is that fresh, riverine, waters which are free of Fukushima cesium may have diluted the arrival of the marine Fukushima signal. River water should be free of Fukushima radiation these days since any radionuclides that were atmospherically deposited on land in the weeks and months following the accident in 2011 should have already eroded and passed through the watershed. 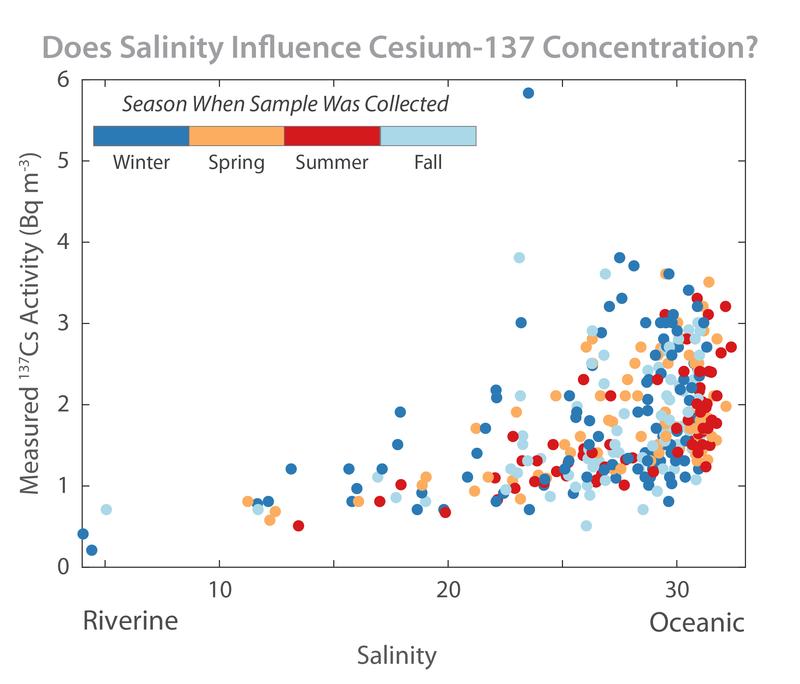 So it is rational that we might see a mixing line in our data where fresher, river influenced, samples have the lowest 137-Cs concentrations while saline, oceanic influenced samples would have the highest 137-Cs concentrations. For each of the 400+ InFORM samples collected by our citizen scientists, we have a temperature and salinity associated with the cesium measurement. By graphing the salinity with the cesium, we see a suggestion of the hypothesized mixing line, but the correlation is not a tight relationship (the correlation coefficient is only 0.5, though it is significant at the 95% confidence level). Examining the season when each sample was collected does not reveal a clear seasonal signal which might be expected from the BC coast which is known for its rainy falls and winters.Breaking the dataset down by regions, differences in the strength of this salinity/cesium relationship become apparent and contribute to the regional mixing story that we have been exploring. 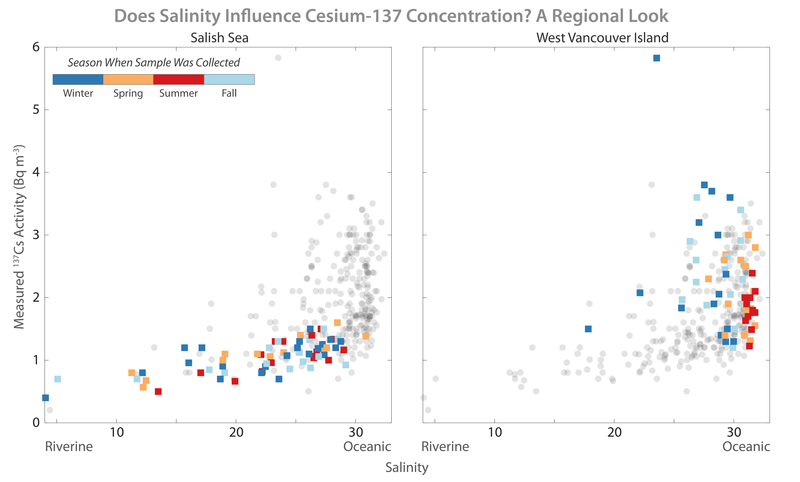 We see in the graph (above left) a rather tight relationship between salinity and cesium activity in the Salish Sea (samples collected from Salt Spring Island, Vancouver, and Powell River) which rather clearly denotes the hypothesized mixing line. Here the significant correlation coefficient is the highest of any region at 0.72. There is no clear seasonality though. This makes sense because the Salish Sea is an estuary with many fresh water river sources. By far the dominant source of fresh water is from the Fraser River which has its peak flows in summer due to snowmelt from its Idaho sized watershed. 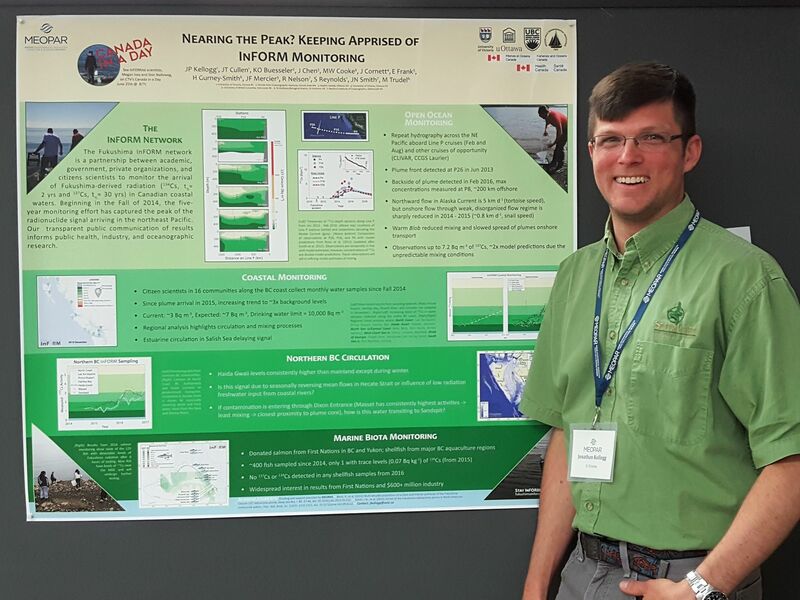 However, the smaller watersheds that drain the coastal mountains of Vancouver Island and the Sunshine Coast are more driven by rain events and have their peak flows during the rainy fall and winter seasons. So as our InFORMal scientists are sampling these waters, they are capturing these freshwater cycles as well as the arriving Fukushima plume. On the West Coast of Vancouver Island (above right with samples collected from Tofino, Ucluelet, and Bamfield) there is no significant relationship between salinity and cesium and most of the samples show a very clear oceanic influence, as expected. These samples do show a clearer seasonal relationship with salinity, though, as all of the coastal watersheds are small (some of the largest are only 2x the size of Vancouver city limits) and highly influenced by the seasonal rains. 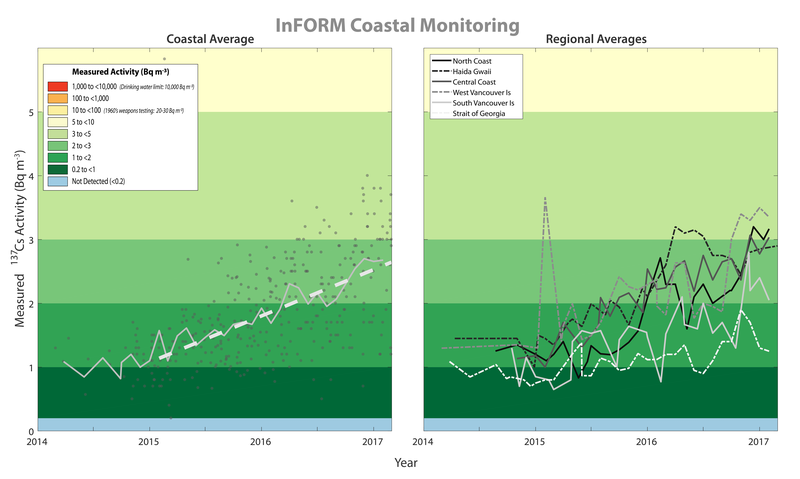 The two regions above are the extremes in our dataset and clearly show simply measuring salinity is not an effective proxy for the cesium concentration in the coastal environment. While there are indications of a somewhat tight relationship in semi-enclosed estuaries, like the Salish Sea, the relationship breaks down with more oceanic influence. If you recall from the last newsletter, we were planning to investigate the role of rivers influencing the cesium concentrations from samples on the north coast. While we did find a significant relationship there, the correlation is weak (~0.5) so more work is necessary to determine the origins behind the observed signal. Following up on the nine samples that were prepared for extended analysis, Dr. Michael Cooke reports that 7 samples completed their two week duration on the detector, but two remain. All of these samples are placed on the same detector to improve data quality, but sometimes this detector is needed for other analyses. He hopes the remaining samples will be processed shortly. Salmon samples for 2017 have begun arriving for preparation at the University of Ottawa and analyses on the gamma spectrometer at Health Canada across town. We hope to again have nearly 100 samples generously donated from hatcheries and the subsistence fishery of our many First Nations partners.